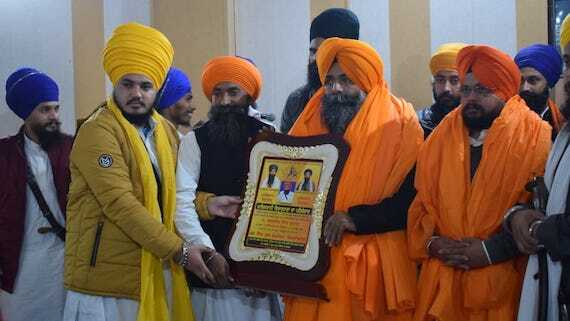 The Sikh Youth Federation Bhindranwale (SYFB) today (Jan. 20) honoured Sarabjeet Singh Ghumaan, author of book on former Punjab police chief KPS Gill. Several youth groups namely Sikh Youth of Punjab, Sikh Youth Federation Bhindrawala and Jatha Sirlath Khalsa today took a march in the city exposing Badals and their coterie for engineering NOC to controversial film Nanak Shah Fakir. 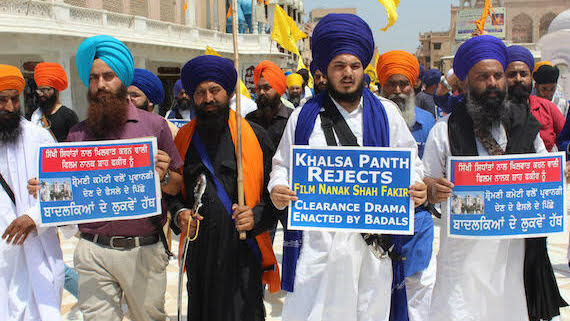 Three Sikh youth groups namely, the Sikh Youth of Punjab, Sikh Youth Federation Bhindrawala and Jatha Sirlath Khalsa today accused high-ups in SAD (Badal) hands for giving clearance to controversial film Nanak Shah Fakir. A Sikh youth groups took serious note of putting Punjabi at third place on sign-boards placed at Jallianwala Bagh Memorial in Amritsar. Members of the Sikh Youth Federation Bhindranwale (SYFB) today marked 11th foundation day of the organization. It is learnt that the Amritsar district police on Tuesday (June 13) released a Sikh youth named Daljit Singh after keeping him in illegal custody several days. The Sikh Youth Federation Bhindranwala (SYFB) today marked the 26th martyrdom anniversary of Shaheed Bhai Gursahib Singh Mandiala. Members of Sikh Youth Federation Bhindranwala held an Ardaas samagam in the memory of 13 Sikhs who were killed by so-called Nirankaris at Amritsar on the Vaisakhi day in 1978. Punjab shutdown call made by Bhai Dhyan Singh Mand, who was declared to be ‘Jathedar’ of the Akal Takht Sahib by the organisers of the Sarbat Khalsa 2015 did not evoke much response amidst reports of arrests and detentions of the members of the Sikh groups who had supported the band call. Sikh Jathedar's move to announce pardon for Dera Sauda Sirsa chief Gurmeet Ram Rahim has invited strong criticism from Sikh circles. 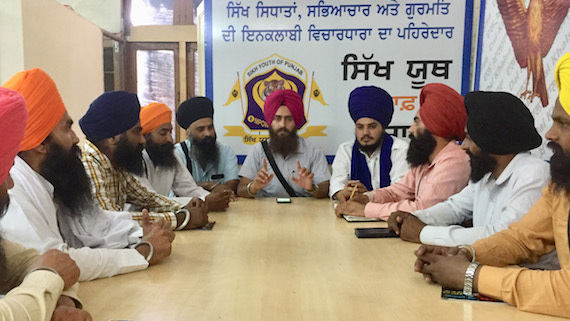 Sikh Youth Federation Bhindranwale (SYFB) and Shiromani Akali Dal (Amritsar) have announced to hold ‘Ghallughara Remembrance March’ on June 3 in Amritsar. SYFB president Bhai Gurjinder Singh told Sikh Siyasat News (SSN) that the march will commence from Gurudwara Sri Santokhsar Sahib on June 3 at 5pm. Sikh bodies, including Sikh Youth Front, Sikh Youth Federation Bhindranwala (Amritsar), Shiromani Akali Dal (Amritsar) and Shaheed Baba Deep Singh Club (Takhanvadh) today marked 26th martyrdom anniversary of Shaheed Bhai Darshan Singh Takhanwadh. A Shaheedi Samagam was held on this occasion at village Takhanwadh. Sikh Youth Federation Bhindranwala (Amritsar) President S. Gurjinder Singh said, in a written statement, Bapu Surat Singh Khasla struggle is shaking the roots of Punjab's ruling Badal regime with the passing days. Sikh Sangat today marked 29th martyrdom anniversary of Khalistan Shaheed, Bhai Sukhdev Singh Sakhira. A Shaheedi Samagam was organized by the Sikh Youth Front on this occasion tat village Sakhira near Tarn Taran. A written statement by the Sikh Youth Front (SYF) states that the Sikh youth group, in association with of Sikh Youth Federation Bhindranwala, is going to mark martyrdom anniversary of Shaheed Sukhdev Singh Sakhira at his village Sakhira near Tarn Taran Sahib. Sikh Youth Federation Bhindranwala organized a Gurmat Samagam in memory of 13 martyred Singhs of 13 April, 1978. Bhog of Sri Akhand Path Sahin were held in the memory of martyrs. Activists of Sikh Youth Federation Bhindranwala reportedly honored 45 families of martyred Sikh freedom fighters of the current Sikh struggle with Siropao at Gurdwara Dera Baba Nanak on February 11. Sikh Youth Federation (Bhindranwala) has appealed to the Sikh nation to attend the 24th martyrdom anniversary of Shaheed Bhai Gursahib Singh Mandiala. 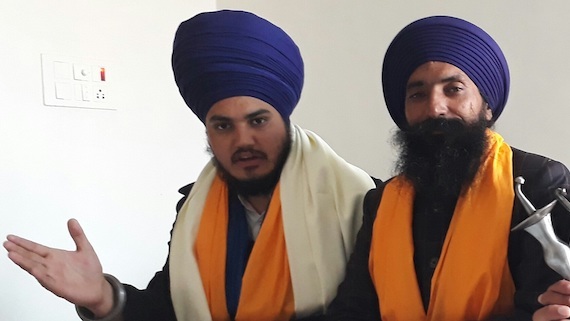 Bhai Balwant Singh Gopala (President, Sikh Youth Federation Bhindranwala) and Bhai Ranjit Singh Damdami Taksal (Senior Vice President SYFB) said in a press meet that it was duty of every Sikh to mark the martyrdom anniversaries of those who sacrificed their lives for dignity of the Sikh Nation.